Here’s a dish for sea-food lovers! Prawn Vindaloo is a cuisine from Goa-India. 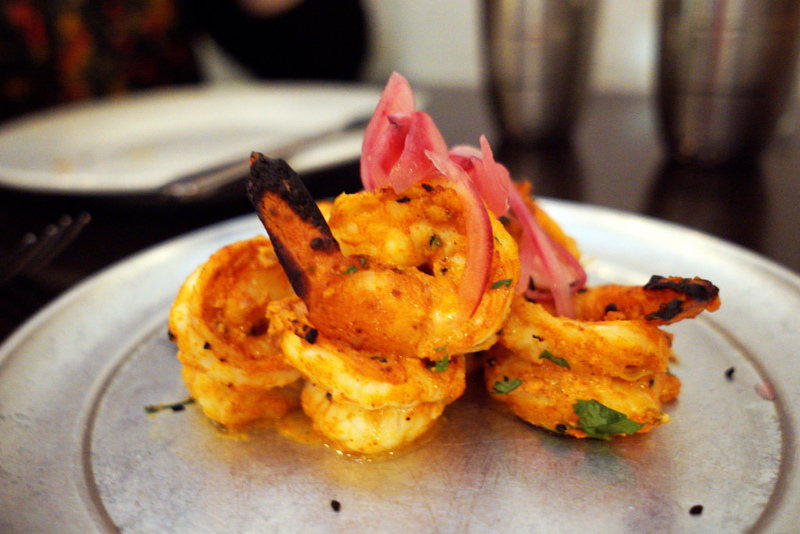 Vindaloo means something quite spicy, so the name explains it all; this dish contains prawns cooked in a spicy sauce. This is a quick recipe and easy to make at home. Served over steamed rice, it is very popular amongst people of coastal regions of India. Put the prawns in a bowl and add red chili powder, turmeric powder, some salt and lemon juice. Coat all prawns nicely from all sides and keep aside for 20 minutes to marinate. Now dry roast all spices i.e. whole red chilies, coriander seeds, mustard seeds, black pepper corns, cloves, cinnamon, cumin seeds and green cardamoms. Let them cool down to room temperature and them put them in a blender jar. Add chopped ginger and vinegar and grind to make paste. Add a little water if required and keep the paste aside. Put a pan on medium heat with oil in it. Add finely chopped onions and sauté while stirring until light brown in color. Now add minced garlic and sauté for two minutes more. Add finely chopped tomatoes, mix all and simmer until tomatoes are tender. Add ground spices paste and some salt (keep in mind that some salt has already been mixed in marinade). Cook for further two minutes while stirring. Add marinated prawns, toss them in the spices and cook for 6 – 8 minutes or until the prawns are nicely cooked. Remove from heat and transfer into a serving bowl. Serve hot with steamed rice. Tip: Prawns cook really quickly so keep a constant eye on them while cooking.